Chances are if you find a great stock, it likely has some great peers. And if you do find a great stock, wouldn’t it be great to find ones even better? Now you can, faster and easier than ever. With statistics showing roughly half of a stock’s price move can be attributed to the group that it’s in (i.e., its industry), it’s never been more important to ‘know the company your stock keeps’ than now. So let’s get right into it. To use the Peer Report or Industry Data feature, just create a screen like you normally would, or run a report on a Portfolio or run any one of our predefined screens or your own saved screens. For this demonstration, I’m going to run one of our predefined screens that comes with the program: bt_sow_momentum_method1. Go to Screen on your Menu Bar and then click Open Screen Definition. When the Screen Definition window pops up, double-click on the SoW folder. Then, find the screen titled: bt_sow_momentum_method1.und. Select it and hit Open button or simply double-click the screen with your left mouse. Now, click the Run Query button like you normally would to run a screen and it’ll display a list of all of the qualified tickers. As you know, as a default, the report is organized by its M or Medium sized Industry. If you want to organize and sort it differently, you can go to Data on your Menu Bar and click Organize/Sort. Or you can click on the Organize/Sort Report button on the Tool Bar. 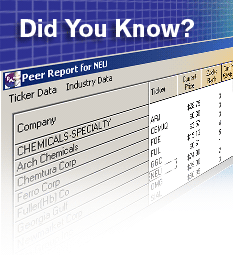 Let’s access the Peer Report feature for ticker NEU. Left click on ticker NEU and then right-click it. Typically as many as seven of its closest peers within its X or Expanded Industry category will pop up. The Peer Report will display the same Items that are in the regular report. It will also display the X Industry’s name above the Peer Companies’ names so you’ll know precisely what X Industry it’s in. For this, let’s select the Interactive Charts and ZER. 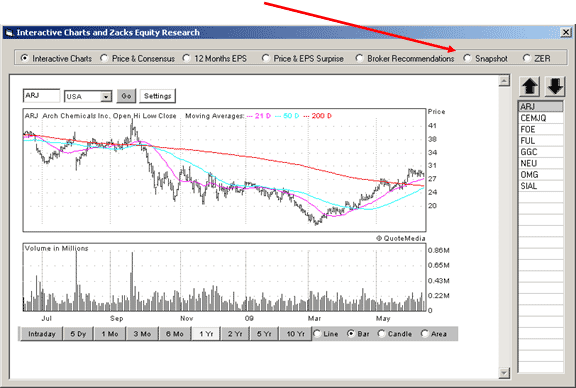 Once you do, the Interactive Charts and Zacks Equity Research window will pop up. Click on any one of the radio buttons to pull up its overlay chart. You’ll notice the Snapshot can also be accessed from this window as well (second radio button from the right). To close this window, just click the X in the upper right corner of the Peer Report window. Let’s say you want more than just the closest Peers. Let’s say you want to dig deeper and see all of the stocks within its X Industry. You can. 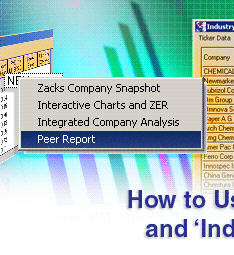 In the upper left corner on the Peer Report window, left click on Industry Data. 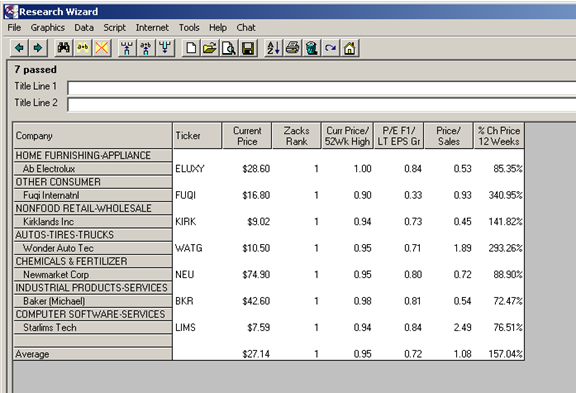 Note: When you are viewing the Peer Report, the Industry Data option will appear on the Menu Bar next to Ticker Data. 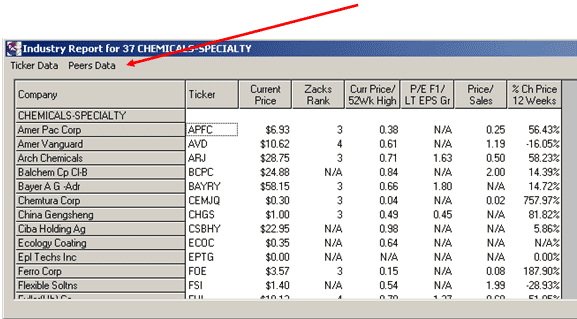 When you’re viewing the Industry Report, the Peers Data option will appear on the Menu Bar next to Ticker Data. order, a double-click of the column header will do so. Double-click it again and the sort is reversed. To exit out of this report window, just click the X in the upper right corner of the window like you would any of the other windows. 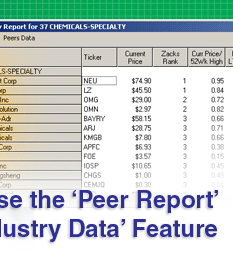 The Peer Report and Industry Data features are not only great conveniences, but are also extremely powerful analysis tools to find peers of your winningest stocks and to scan entire Industries. your stocks industry and where it stacks up. Try this feature out today. You’ll love it.